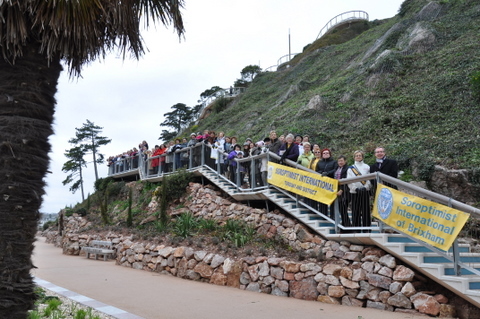 Brixham Soroptimists marked International Women’s Day on Friday 8th March by inviting women from other clubs, Inner Wheel and RNLI Lifeboat Guild, to join them on the gangway of The Golden Hind in Brixham in order to support their campaign for Violence Against Women. One in three women will be raped, beaten or abused in her lifetime so enough is enough! Mr Simon Reed the owner of the Golden Hind very kindly allowed his boat to be used for this occasion. 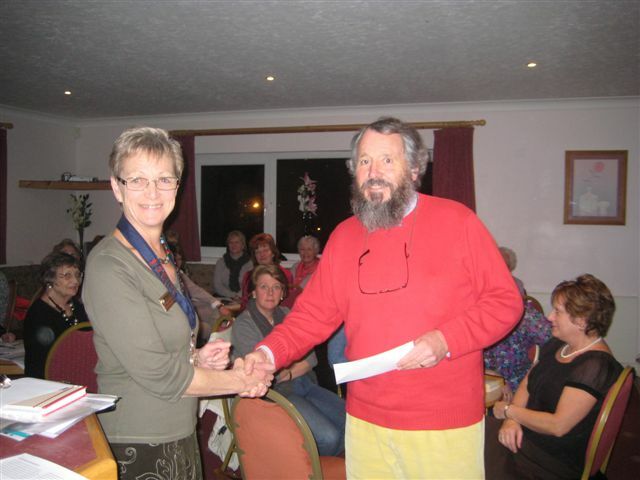 In February 2012 the Club was able to present Chris Helyer from the Mayenziwe Project with a cheque to enable him to build a toilet block for girls at a school in the Eastern Cape South Africa. 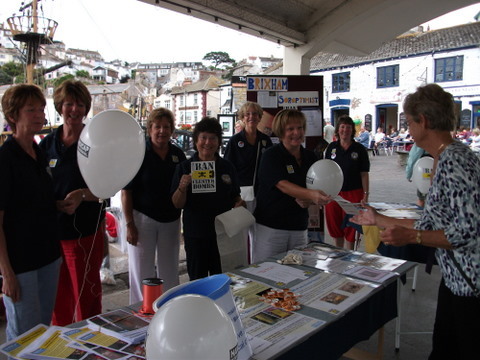 On Sunday 6th March 2011, to mark International Women’s Day 100th anniversary, our club organised a rally at the Princess Theatre, Torquay where there were stands depicting aspects of programme action work. 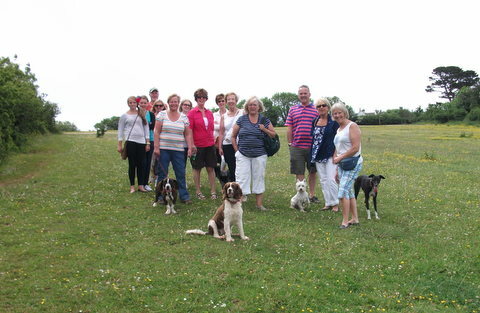 The rally was attended by both Brixham and Torquay clubs, Inner Wheel, Women’s section of The Royal British Legion and other ladies. The mayor of Torbay, Nick Bye also attended. 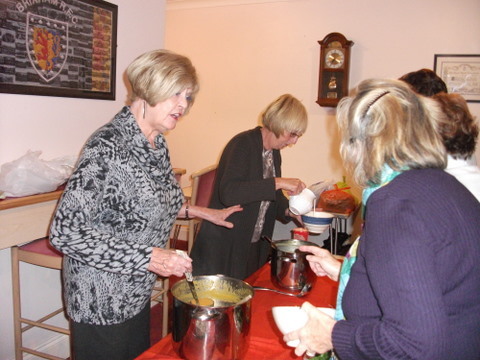 To mark World Food Day members enjoyed a soup supper before the start of their October business meeting. Members May Harland and Joyce Cowling made and served delicious soup and member Jessica Beatty, a baker, donated bread rolls. 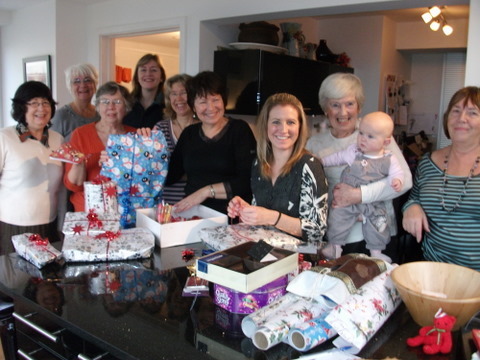 £107.00 was raised for the local women’s refuge and members also collected various household products that were donated to the women’s refuge in Torbay. 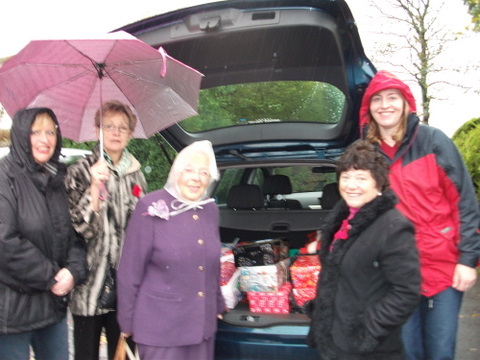 Brixham President Pam Evans and President Elect Sheila Andrews and other club members braved the rain to deliver shoe boxes for Operation Christmas Child. 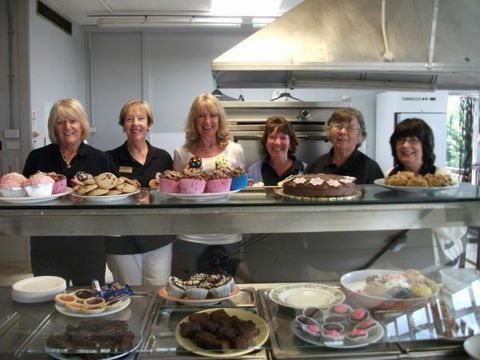 Picture shows left to right Caroline Stockwell, Sheila Andrews, Marjorie Reeves, Pam Evans, Julia McLeod. On Sunday 1st August 2010, we organised a display on the old fish quay to mark the coming into force of the international ban on Cluster Munitions. 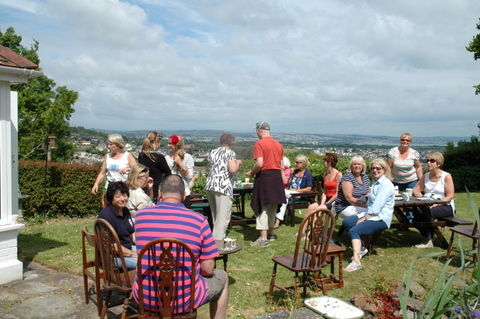 The Brixham event which was watched by many people, was helped by the local Samba Jam Band which are a fairly new local band with ages ranging from 5 years to “vintage”. Informative leaflets were distributed, Purple Teardrop campaign petitions signed and a great deal of interest was shown. We are at present filling shoe boxes with toiletries, snacks etc., which will be sent to the frontline troops in Afghanistan to mark the International Day of Peace in September. This morning the CMC officially issued their report on the Entry into Force on the 1st August. You cannot imagine how proud I was to be a Soroptimist when I turned to the page for the UK. There were only two short entries, one from the CMC for their event in London, and.......... they had chosen to report on and show your photograph. Once again, our Soroptimist name is before over 500 campaigners here, and also the many official country delegates who are attending this conference. This website includes links providing direct access to other internet sites. 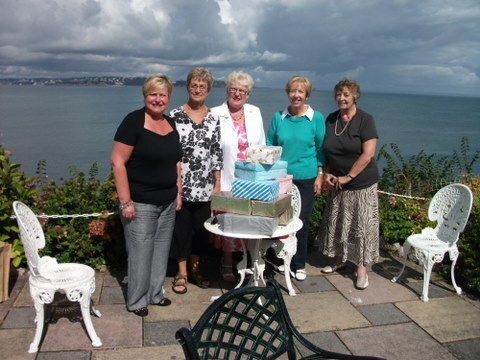 However, Soroptimist International of Brixham takes no responsibility for the content or information contained on other sites, including those of Soroptimist sites that link to this site, nor does it imply endorsement or approval of products or information offered. 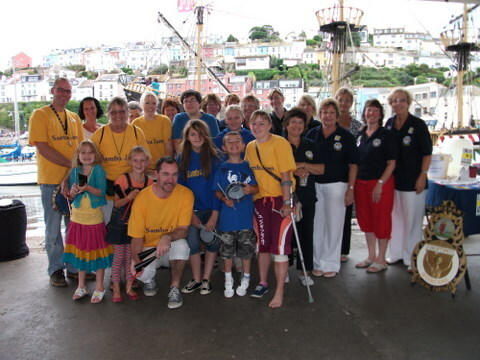 All materials, including text and images, posted on this site are subject to copyrights owned by Soroptimist International of Brixham and/or other individuals or entities. 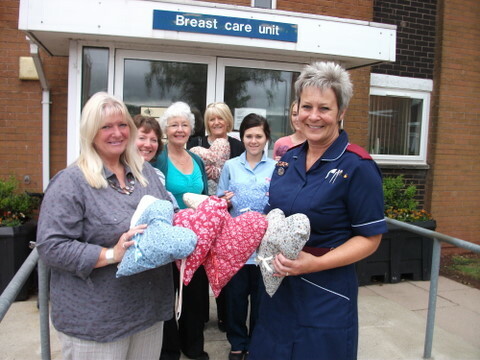 Any reproduction or retransmission of all or part of any information found on this site is expressly prohibited, unless Soroptimist International of Brixham or the copyright owner of the material has granted prior written consent. Copyright © SI Brixham 2004-2014. All Rights Reserved.